With fuel prices reaching all time records, many people are beginning to complain that energy costs are just too high. Well, it’s really no big surprise that energy costs continue to skyrocket when people keep ignoring the importance of something as simple as recycling. Most think “what good are the few cans I just threw in the trash?” or “my recycling effort won’t make a difference”. Unfortunately, that kind of thinking is exactly what keeps energy costs climbing. Did you know that in the United States alone, we throw away enough aluminum cans by weight EACH MONTH to rebuild every commercial airliner in the country? That’s a shameful waste. Aluminum refinement consumes a lot of electrical energy. Your individual effort to toss a can makes a real difference to our environment. If you have a local residential recycling pickup, use it! If not, bag your aluminum cans and save them for your next trip to town, then drop them off at the county recycling center or cash them in at a recycling depot or machine. You might also find a local Boy Scout chapter or church that will gladly accept and process the cans for you, making a little money for themselves in the process. 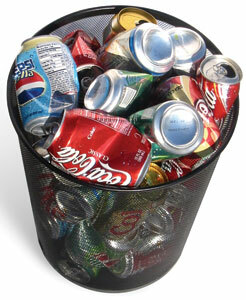 As of 4 /2011, Aluminum prices are up with one pound of scrap aluminum cans now fetching nearly a dollar!. Prices continue to rise. That might not sound like much, but add it up and you might be able to offset the higher price of gasoline simply by cashing in your used beer & soda cans. If you run your own home bar, the money you could save can be reinvested into fresh bar stock. Entertaining at your own Home Bar can also serve up money savings. At current prices, a$3.50 can of beer at the local corner bar costs you only 67 cents at home! Mixed drinks save even more. Learn How to Build a Home Bar using our easy to build plans. Here are some useful site links to help you with your recycling needs. Earth 911 – Locate recycling centers near you. The Aluminum Association – where to recycle. Let’s stop our wasteful ways by recycling aluminum cans, metal cans, glass, plastic, paper and cardboard. Recycle and keep useful resources out of your local landfill. If you know of a recycling center or aluminum can RVM (Reverse Vending Machine) location in your area, please post it in a comment below. Completely agree, we can’t control a lot of the external factors that affect fuel costs, but this is one factor we can control. Let’s all do our part and recycle! My 7 yr old son just started a can recycling business called Cans for Connor. Here’s a link to a video we shot of our first day out. We thought you might find it interesting.